XGO is a formula for computing future stock and commodity prices. It is a very unique formula. It computes the natural energy collected from the universe by an individual or a market. I discovered it as I awoke on January 23, 1996. The formula was just in my head. All I had to do was write it down. Since then XGO has been available to individual traders, and has been used in my work. Several articles and sales brochures have been produced. They are collected here for your browsing. Some material may repeat in each, since each was written to stand alone, but each has new material as well. The original XGO function was implemented as a DOS command line program. When it was first marketed, several web pages were created. These give a basic background for this technology. This annotated chart gives a brief overview of one use of this program. The key point shown here is that this tool extracted the cycle driving the stock for the last 10 months, and showed that the cycle was topping. 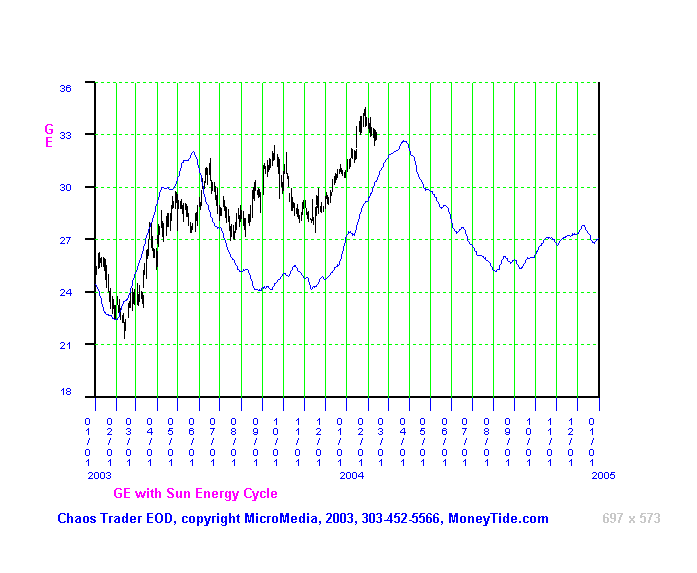 My broker recently suggested I should buy General Electric-GE. I always check out his recommendations with my own tools. I first looked up the first trade date for GE. It is 5/27/1927. I then used WinXGO to generate 3 forecasts for GE, each tuned to a different cycle. 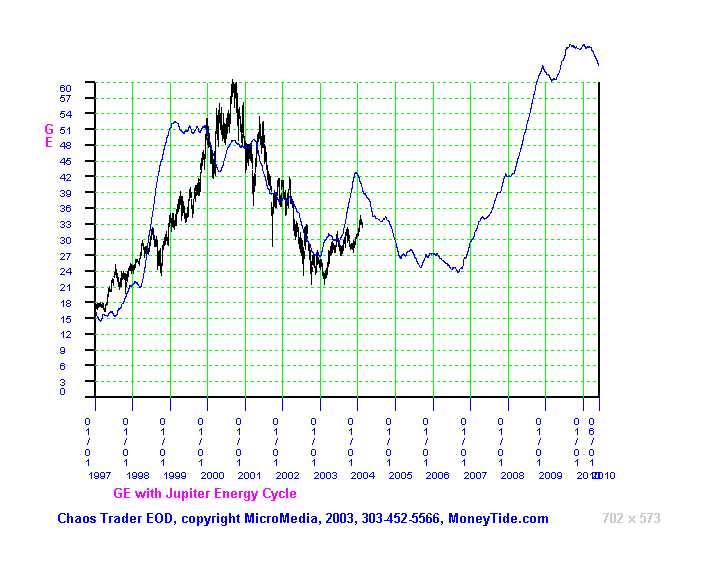 The Jupiter 12 year cycle has been shown to be a mover of stocks. So I computed a 1752 day ZGO for GE (.4 x 12 years). It is shown below. 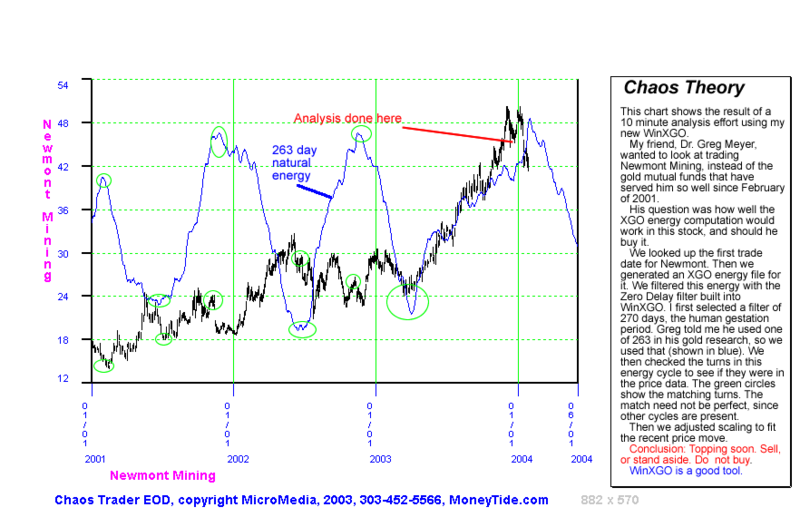 Note what a great job it did of forecasting the rise and fall of GE doring the DotCom Mania. 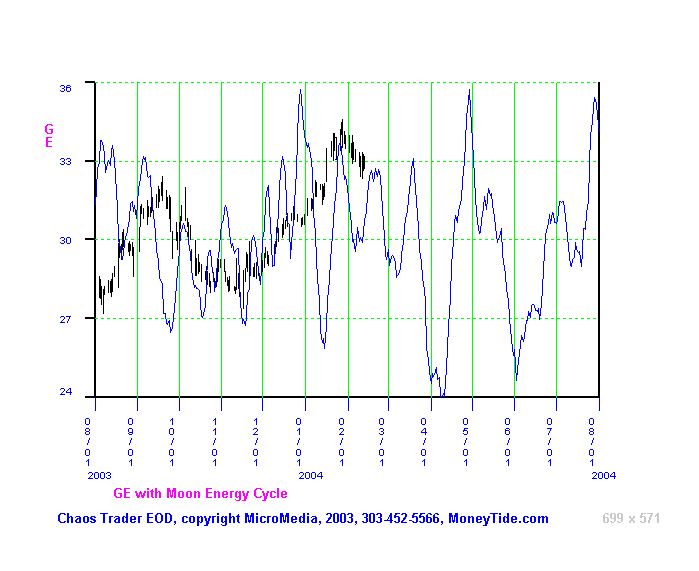 That cycle looks to be topping! The second cycle I computed was the annual cycle. Jupiter spends 12 months in a sign, while the Earth goes around the Sun once. So this cycle shows up strongly in stocks. To get it, I commputed a 146 day ZGO (.4 x 365). This cycle of the year is shown below. That cycle is topping soon. Finally, I wanted to see what the Moon was doing to GE. This took me two calculations, first on a 11 day ZGO, which was too choppy, and then on a 22 day ZGO (.8 x 28 days) . This fit the data fairly well, as is shown below. With this analysis in hand, I decided to ignore my broker's advice. In fact, I may even shop for a put option. And I'll be watching for a buy in 2006. I know of no other tool which can do this, all based on first principles of energy, all done without doing any curve fitting to price. WinXGO can be a very valuable trading tool. When you are satisfied that this tool should be in your trading suite, go to the Cash In On Chaos Catalog to place your order.